Kenyan dishes vary according to the region of the country. The palette for traditional cuisines is mostly neutral, but the modern days have spread notable influences from the Asian community. Nyama Choma (grilled meat) is a favourite way of preparing and eating meat in East Africa, especially when celebrating events. Chicken and beef are commonly used, but goat is by far the favourite. Ugali (maize meal) is a basic staple eaten across several African countries. It only differs in name and consistency (hard or soft). Kachumbari (salsa) has many variations but the main ingredients are always the same — onions, tomatoes, and coriander leaves. Place the water in a pot on high heat. Once the water gets warm, add half the amount of cornflour and stir it. Continue to stir until it thickens and becomes porridge. When you start seeing bubble, cover the pot and leave it to cook for 4 minutes on medium heat. Remove the pot from the heat and add the rest of the cornflour. Stir it. As you mix in the rest of the cornflour it will become harder, almost like play dough, continue to mould it until all the flour is mixed in, and mash all the lumps. Then spread it flat at the bottom of the pot as much as possible, cover, and put back on the fire on medium heat. After 4 minutes, open and stir it up in order to turn it, and spread it back on the bottom, cover, and put back on the heat. Repeat twice. Mould it in the middle of the pot into a nice round shape, and place on a serving dish. Once the onions are done soaking, drain them, then combine with the tomatoes and chopped coriander, finally adding the lemon juice. Get a good charcoal fire going on your grill. Stir 1 teaspoon salt into 350 ml warm water for sprinkling on the meat. Place the rack of ribs and leg on the grill. Make some diagonal cuts on either side of the leg, about a centimetre deep. Monitor and turn both pieces regularly to ensure even cooking. Allow them to brown evenly. Occasionally sprinkle with salty water to keep from drying. Once cooked to medium, sprinkle generously with salty water and wrap them in foil. Make sure the foil is well sealed, with no holes. Place them back on the grill (in the foil) to continue cooking for 45 minutes to 1 hour. The meat will steam inside the foil as it continues to cook and will remain soft and moist. When ready, unwrap, separate the ribs and cut the leg into bite-sized pieces for serving. Aika-Grace Wangwe is not a trained chef, but at home, she is THE chef! Her love for food started at a very young age. Her biggest influence is her mother, and though she would not call herself a chef, to date, Aika-Grace has not eaten anything as good as her mother’s cooking. Aika-Grace runs a food blog called Pendo La Mama — which can translate as either “the love of a mother” or “what mama loves” — where she shares recipes of the dishes she cooks for her family. Thank you for sharing your recipes. I am writing a novel set in Marsabit County, Kenya. I was looking for a traditional meal that would be served a restaurant in Marsabit town. Your recipes work perfectly. Much appreciated! 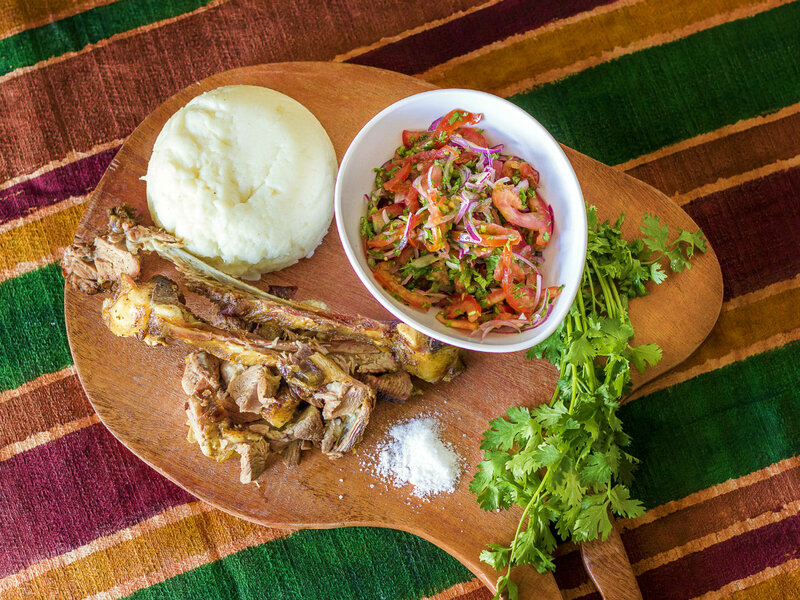 Hapo ujakosea.Ugali nyama choma my favourite dish when I go out with friends,especially when the meat is roasted properly.